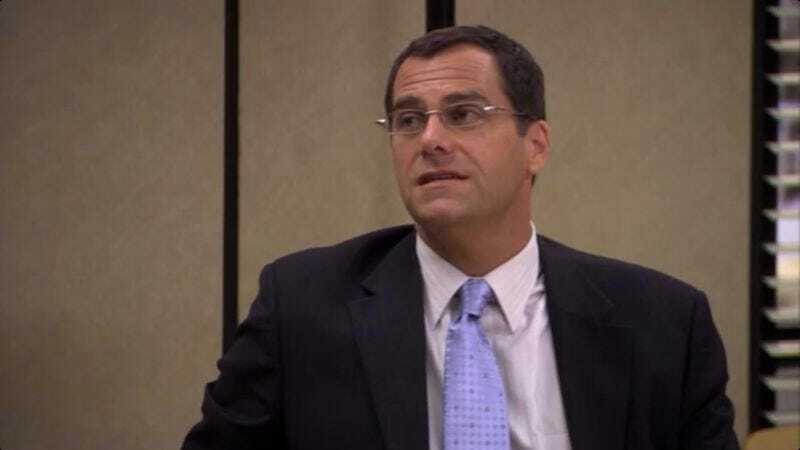 After finally escaping the clutches of Dunder Mifflin, Andy Buckley—the former David Wallace—has just gotten a new job that also revolves around soul-crushing hardship and bloodthirsty monsters that want nothing more than to kill everything they can. In other words, he’ll be joining literally every actor who has ever acted (including—deep breath—Bryce Dallas Howard, BD Wong, Judy Greer, Vincent D’Onofrio, Chris Pratt, Omar Sy, the kid from Iron Man 3, the kid from Melissa & Joey, Jake Johnson, and, of course, Kenny Baker as R2-D2) by signing on to Jurassic World. This news comes from Variety, which unfortunately doesn’t have any details about what sort of character Buckley will be playing. If we can offer up some suggestions, then, maybe he could be the consistently exasperated and charming-yet-dickish CFO of InGen, the company that funded the creation of Jurassic Park. Of course, he surely would have lost his job after the events of the first three Jurassic Park movies, so maybe in this one he can spend his time coming up with horrible inventions that have even worse names. We’re not sure how that will tie in with dinosaurs, but Jurassic World doesn’t come out until June of 2015, so the filmmakers have plenty of time to figure that out for us.